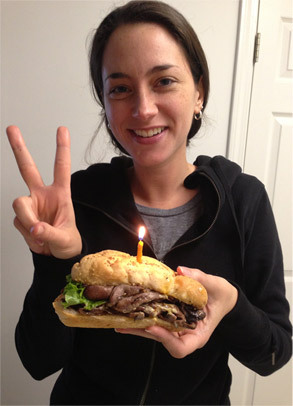 My Celebratory Sandwich - Two Years Of Being Gluten Free! Two years! I’ve been gluten free for two years! I do not have an exact date in April because I had no idea that I wouldn’t be going back, but it was definitely April. Anyway, lots of people celebrate with making gluten free cakes, cupcakes, cookies and other treats, but I decided to celebrate with my most missed convenient food. A sandwich! Non-gf people probably don’t notice how inconvenient quick meals are for us, but they are. Most fast food is off limits (A quick thanks to Chick-fil-A for having a designated fryer for their fries!) and is made to be handheld. Sandwiches, chicken nuggets and wraps are some lunch staples that are oftentimes off limits so like I said, that’s what I had. I went out to Murrysville to the Gluten Free Zone store (I will tell you a bit more about that soon) and ordered from their cafe. They have all Boar’s Head lunch meats and cheeses which are gf and don’t allow any outside food or drinks in the store to prevent any random cross contamination. I ordered myself something I used to eat a lot, a roast beef sandwich with American cheese, lettuce, tomato and sauce. I normally pick mayo but they had a mayo mustard combo that sounded amazing so it was slathered on. I took it to go, stuck a candle it and was a happy camper. It was warm (which I didn’t even think about when ordering), the hearty bread wasn’t crumbly at all and it worked well with my meat and cheese choices. And look at how piled high that meat is! Happy Two Years To Me!